Sheer arcs are an elegant water feature that can be integrated into the pool and spa design alone or with other choices of waterfall, sheer descent, curtain, spillover, or sheer rainfall. Sheer arcs entertain swimmers while adding that visual and auditory enhancement so valued in water features. Often giving a much needed curving visual element to the pool, sheer arcs are also just as much fun to play in as other water features. 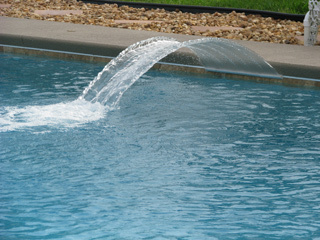 Sheer arcs can be placed right at the water line so that you have the appearance of a seamless flow into the pool.